Download "Our patent and trade mark attorneys are here to help you protect and profit from your ideas, making sure they re working every bit as hard as you do." 1 Our patent and trade mark attorneys are here to help you protect and profit from your ideas, making sure they re working every bit as hard as you do. Our people work with everyone from multi-nationals to start-ups, delivering jargon-free advice that tells our clients exactly where they stand. From day-to-day filing through to advising on IP strategy and due diligence, we offer a complete patent and trade mark service. 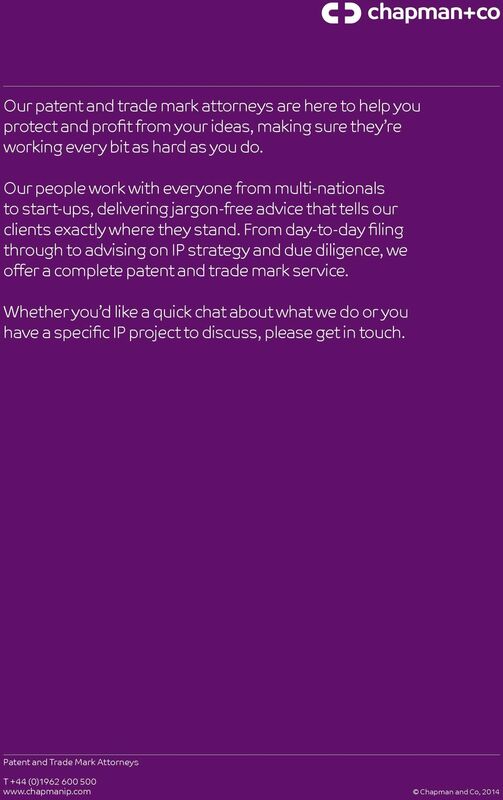 Whether you d like a quick chat about what we do or you have a specific IP project to discuss, please get in touch. 3 the risk of this disclosure causing problems for any patent application subsequently filed. In addition to being novel, an invention must also be inventive. This means that the invention must be more than an obvious development of what is already known. Some types of invention, such as pure business methods, are not patentable at all, even if they would be considered novel and inventive. We can advise you as to whether your invention would be likely to satisfy these conditions. What is the procedure for obtaining a European patent? 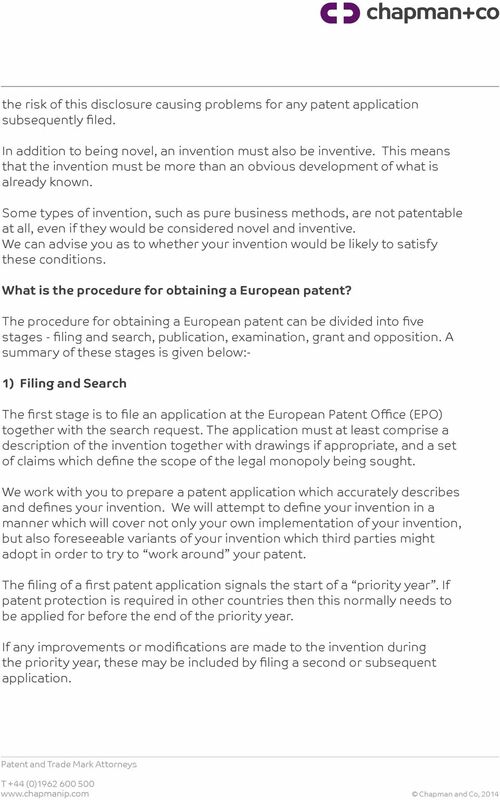 The procedure for obtaining a European patent can be divided into five stages - filing and search, publication, examination, grant and opposition. 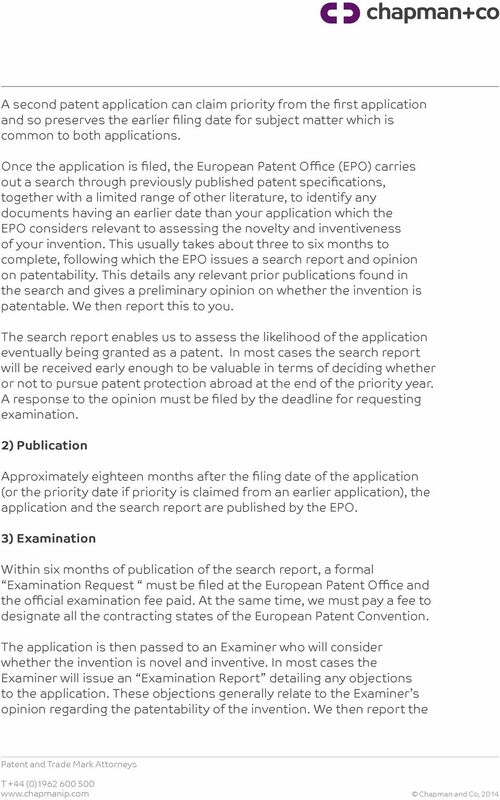 A summary of these stages is given below:- 1) Filing and Search The first stage is to file an application at the European Patent Office (EPO) together with the search request. The application must at least comprise a description of the invention together with drawings if appropriate, and a set of claims which define the scope of the legal monopoly being sought. We work with you to prepare a patent application which accurately describes and defines your invention. We will attempt to define your invention in a manner which will cover not only your own implementation of your invention, but also foreseeable variants of your invention which third parties might adopt in order to try to work around your patent. The filing of a first patent application signals the start of a priority year. If patent protection is required in other countries then this normally needs to be applied for before the end of the priority year. If any improvements or modifications are made to the invention during the priority year, these may be included by filing a second or subsequent application. 5 Examination Report to you and, following discussion with you, we prepare and file a response which deals with the objections. 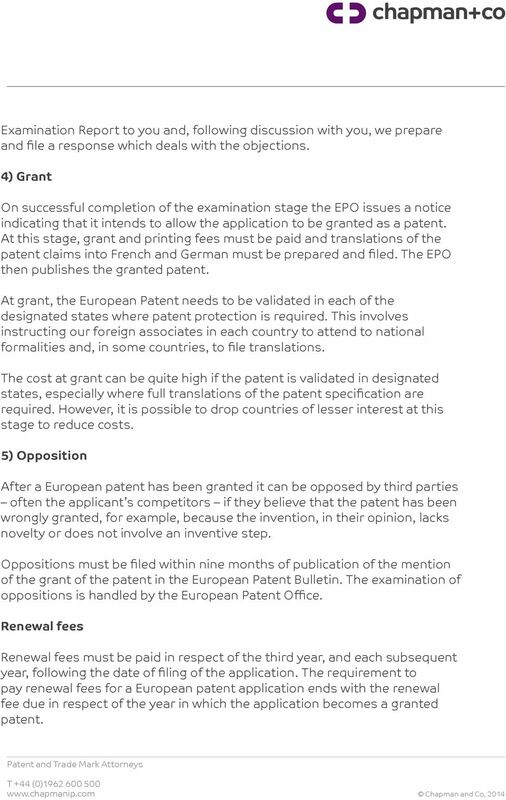 4) Grant On successful completion of the examination stage the EPO issues a notice indicating that it intends to allow the application to be granted as a patent. At this stage, grant and printing fees must be paid and translations of the patent claims into French and German must be prepared and filed. The EPO then publishes the granted patent. At grant, the European Patent needs to be validated in each of the designated states where patent protection is required. This involves instructing our foreign associates in each country to attend to national formalities and, in some countries, to file translations. The cost at grant can be quite high if the patent is validated in designated states, especially where full translations of the patent specification are required. However, it is possible to drop countries of lesser interest at this stage to reduce costs. 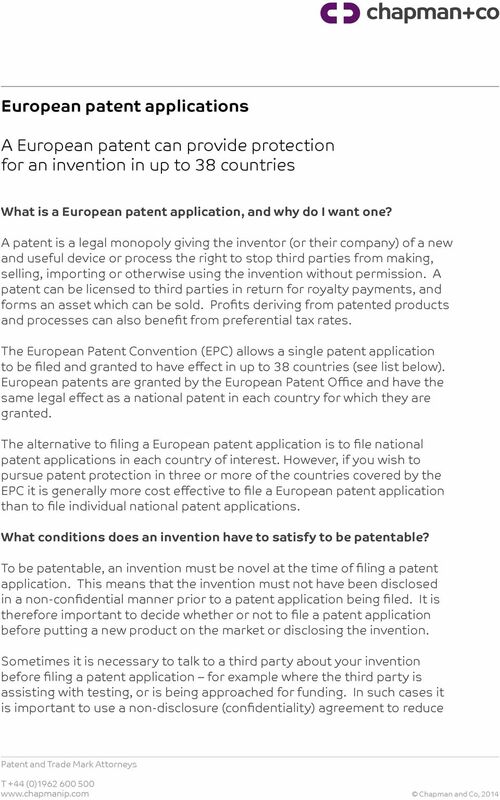 5) Opposition After a European patent has been granted it can be opposed by third parties often the applicant s competitors if they believe that the patent has been wrongly granted, for example, because the invention, in their opinion, lacks novelty or does not involve an inventive step. Oppositions must be filed within nine months of publication of the mention of the grant of the patent in the European Patent Bulletin. The examination of oppositions is handled by the European Patent Office. Renewal fees Renewal fees must be paid in respect of the third year, and each subsequent year, following the date of filing of the application. The requirement to pay renewal fees for a European patent application ends with the renewal fee due in respect of the year in which the application becomes a granted patent. 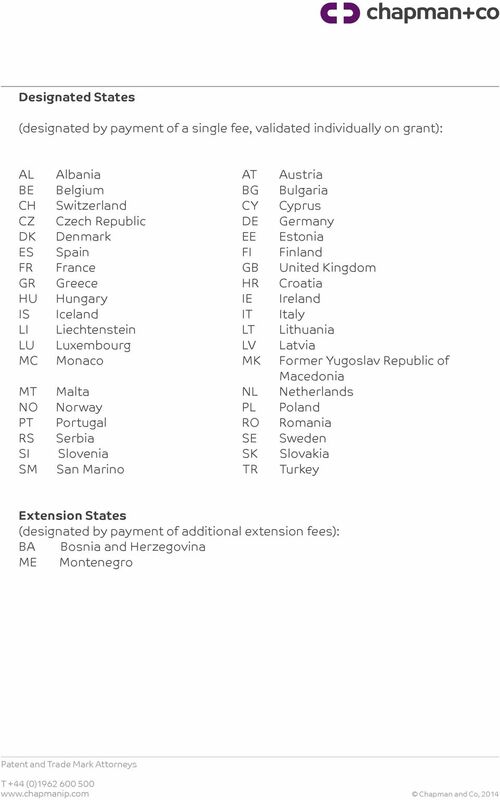 6 Following grant of a European patent national renewal fees become payable in respect of each country in which the European patent is validated. Pre-Filing Search In some cases it may be beneficial to carry out a search of the prior art databases ourselves before preparing and filing a patent application. We will advise if we think this might be of value to you, and if so can instigate a search and assess the significance of the results of the search. 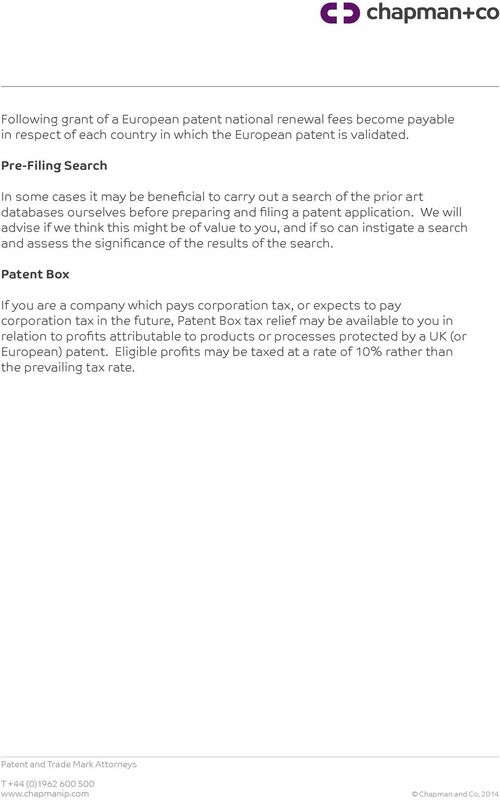 Patent Box If you are a company which pays corporation tax, or expects to pay corporation tax in the future, Patent Box tax relief may be available to you in relation to profits attributable to products or processes protected by a UK (or European) patent. Eligible profits may be taxed at a rate of 10% rather than the prevailing tax rate. ENTERING THE EU BORDERS & VISAS THE SCHENGEN AREA OF FREE MOVEMENT. EU Schengen States. Non-Schengen EU States. Non-EU Schengen States. The summary table below shows how the composition of the trading partner groups changes on 1 January 2015 as a result of the enlargement. International transfers are not always easy to understand. SEPA, Page 1 of 8 International transfers are not always easy to understand. We re here to help you. International payments. SEPA, Page 2 of 8 The idea of a single European payments area. SEPA the concept. I have asked for asylum in the EU which country will handle my claim? Private Sector Debt Dívida do Sector Privado. dossiers. Economic Outlook Conjuntura Económica. Conjuntura Económica. QATAR CENTRAL BANK INTERNATIONAL BANK ACCOUNT NUMBER (IBAN) - QATAR STANDARDS DOCUMENT. E-Banking Instructions IBAN Standard Annex No. What do the recent regional GDP statistics tell us about Cohesion? 1 Teachers' and School Heads' Salaries and Allowances in Europe 2014/15 This document is published by the Education, Audiovisual and Culture Executive Agency (EACEA, Education and Youth Policy Analysis). Schengen routing or Schengen encryption?